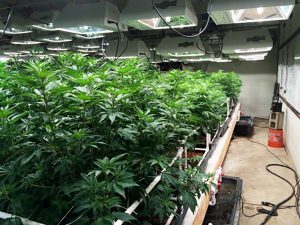 Growing cannabis plants using hydroponics means you are growing without soil, but it doesn’t necessarily mean that you are growing plants without a soil replacement. While not strictly necessary it is usually advantageous to use some form of growing medium. One very good reason to use a growing medium in your hydroponics garden is to ensure that the roots of your plants are adequately supplied with oxygen. In a traditional garden plant roots gather oxygen from the air trapped in the soil. A growing medium serves the same purpose for plants grown with hydroponics. Growing media are designed to trap air that can then be processed by the plant roots. Another reason for using a growing medium is to provide a food reserve for the plants. Like air, nutrients from the feeding solution are trapped in the pores of the growing medium and are then available to the plants if needed. This can help to prevent crop failures. Here’s a quick rundown of the kinds of media available to you when gardening without soil. Made from basalt rock and chalk, Rockwool is probably the most popular growing medium used by hydroponics gardeners. This porous material can trap large quantities of air and water at the same time. Perlite is a pebbly volcanic rock that provides excellent drainage and aeration when used as a growing medium. It has a good drainage characteristic which means it does not hold much water and limited ability to trap nutrients. Vermiculite is a mineral that acts like a natural wick and is able to absorb large quantities of water. The combination of Perlite and Vermiculite is a natural for hydroponics system: one holds air and oxygen, the other holds water and nutrients. Made from the outer husks of coconuts this growing medium is becoming increasingly popular with organic growers. Some hydroponics growers feel coconut fibres are superior to Rockwool in their ability to retain air and water. This medium is made from baked clay. The pellets are porous and retain both air and water very well. They can be reused as long as they are first sterilized. This is the same colored gravel that is used in fish tanks. The main reason for its popularity is expense as it is inexpensive compared to other growing media. The downside is that it does not hold water, and therefore plant nutrients, very well at all. If you choose to use aquarium gravel you will need a constant water supply for your plants to avoid root drying.